Gold Fields employees at KDC West in Carletonville are set to return to work on Friday – but their return to work comes once more at great cost to the National Union of Mineworkers, who missed a chance to win back some modicum of trust from the workers. By SIPHO HLONGWANE & KHADIJA PATEL. A fair amount of confusion has reigned over the activities surrounding the wildcat strike at Gold Fields’ KDC West operation near Carletonville in the West Rand. The company had said that it would sack anyone who hadn’t reported to work by 14:00 on Thursday, but according to the company’s own statement, about 11,000 workers on strike clocked in, leaving a good number fired. “Approximately 1,500 employees who did not report for work before the deadline are deemed dismissed,” the statement said. Miners explained that they had not returned to work on Wednesday as they were waiting for the National Union of Mineworkers (NUM) president Senzeni Zokwana to address them. When Zokwana visited KDC West on Wednesday, accompanied by Cosatu General Secretary Zwelinzima Vavi, he apparently promised to meet the strike committee at 11:00 and formally table the offer made by the Chamber of Mines. Since he hadn’t appeared by the deadline time set by Gold Fields, they didn’t go to work. Then the company said in a statement that those workers who hadn’t turned up were deemed dismissed. Some news stories said, however, that the deadline had been extended to Friday at 14:00. To further compound the confusion, a representative of the Association of Mineworkers and Construction Union (AMCU) arrived and convinced the workers to return to work on Friday. Workers reportedly agreed to do so, also agreeing to cancel their memberships to NUM immediately and switch to the new union. Knowing only that a 14h00 deadline had been set, we went to KDC West to see if the workers would oblige. “Caution, Industrial Action – Rather Use Alternative Route,” screamed the signs in front of us. But we powered on. The sight of a shack settlement ahead of was reminiscent of Marikana. As we drove on, a small group of men ambled past us. One of them paused and motioned for us to stop. He crossed his arms in front of his chest. An Orlando Pirates fan? Here, in the thick of a strike? We weren’t sure what to make of it until further on, another group of men made clear to us that we would not be allowed further up the hill. They all seemed friendly enough, but their warning of danger was clear. We really weren’t brave enough to venture further. Just as we turned the car around, we caught sight of hundreds of people assembled on the hilltop adjacent to us. With just hours to go to the deadline issued by Gold Fields for workers to return to work, workers assembled here certainly did not look like they were returning to work. We had to try to get back to the strike action from the opposite end of the mountain. After a few minutes of eyeing us suspiciously, interspersed with speaking urgently into his walkie-talkie, he told us we actually needed to head to the Gold Fields Libanon Business Park to apply for accreditation to be allowed in. We showed every intention of doing just that, but exited the KDC West complex, only to enter through the next entrance a few hundred meters further down the road. With little fuss at this checkpoint, we parked in the shade and began the great trek to the hill where workers were gathered. The only police presence appeared to be one van. Gold Fields security controlled the comings and goings from the hilltop where workers were gathered. And despite the checkpoints and security guards wearing belts of tear gas canisters, the hefty security presence was entirely at odds with the atmosphere among the striking workers. It certainly was not a threatening atmosphere and the paranoia of Gold Fields security seemed rather exaggerated. Workers, however, were quick to lump security among their complaints against Gold Fields management. At least five different workers claimed that Gold Fields security, together with members of the South African Police, raided hostels on the KDC West compound on Wednesday night, breaking down doors and forcing workers to report to work. This kind of behaviour from Gold Fields security is a reason many workers eschew the hostels, claimed a machine operator identified only as Skilla. According to workers, police detained a small group of workers at one hostel on Wednesday night. A member of the strike committee who declined to be named said that they had not returned to work on Thursday because they were waiting for Zokwana, or any other member NUM representation. He had been there the day before, and had promised to return and formally make an offer, which they were happy to receive. “We have been waiting for him from eleven o’clock. And now look at the time; it’s almost four o’clock and still he didn’t come,” Skilla added. The committee member said that workers wanted equalisation of pay, meaning that all work categories would be bumped up to the next pay level. They also demanded that all NUM leaders at the company resign and that all workers that Gold Fields suspended be brought back to work. Another demand is for workers detained by the police to be released before workers return to work. Workers soon left the hilltop. Some headed back to their shacks, others to the hostels. Women returned from work carrying groceries on their heads while children played among the barricades – constructed from street furniture. 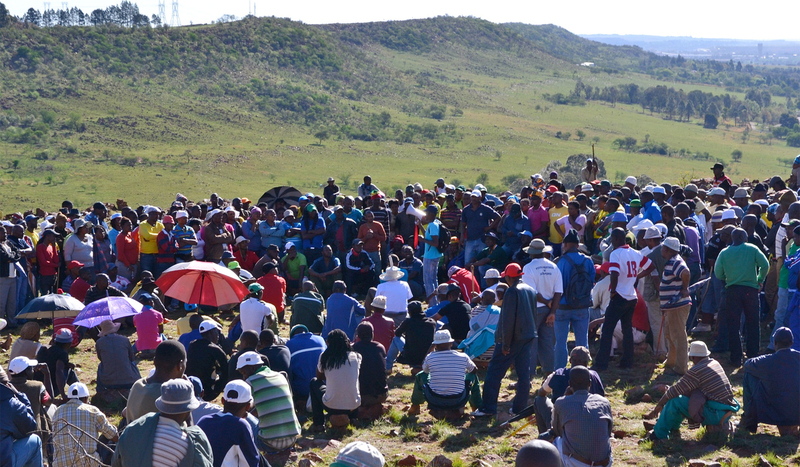 As we chatted to Skilla and Verlane, another worker rushed up the slope that separated the shack settlements, whistling to get workers’ attention and announcing that AMCU president Joseph Mathunjwa had arrived. Moments later, a grey Mercedes Benz C-Class with hazard lights flashing furiously rushed past us. A look up at the hilltop confirmed that workers had already begun reassembling. There was suddenly a sense of expectation in the air. Later, we heard from several sources that it was in fact AMCU general secretary Jeffrey Mphahlele who had addressed workers. Whoever the AMCU representative in the Mercedes was, he got workers to agree to return to work on Friday, and that they should quit NUM and join his union. The workers had already decided to go back to work on condition that NUM left the mine completely, that their comrades were freed and that equalisation happened. They then planned to negotiate for R12,500 net pay while still working. It appears that they plan to bring AMCU in and have them negotiate on their behalf. Another strike committee member called Aubrey* said that if Gold Fields did not accept AMCU as the legitimate representative of workers, or if NUM refused to leave, workers would then go back on strike. Verlane, however, said that though AMCU was the only viable alternative to NUM, workers would be happy to join any other union that was an alternative to NUM. “Even if it is a union we start here in Carletonville, we will all join it,” he said. For many workers, however, the urgency of their demands has been blighted by what they perceive to be treachery from the unions. At the very bottom of the chain, ordinary workers who just want to be able to live better lives feel overwhelmed by the politicisation of the strike.